The 10 Best Sports Bars in Utah! With multiple college rivalries, Real Salt Lake, and the Utah Jazz, Utah is a great place for sports fans. Fortunately, there are also a good number of popular sports bars to accommodate those fans. 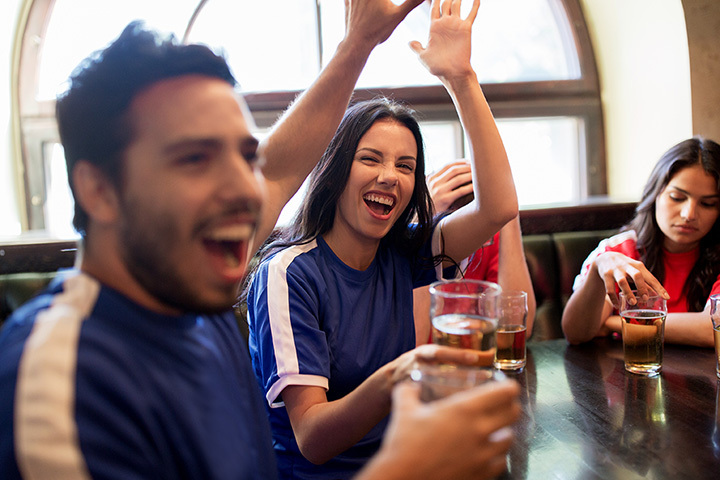 Wear your team colors with pride, grab a beer, and root for your team at these 10 great sports bars in the state. With locations in Holladay, Salt Lake City, Herriman, Layton, Ogden, and Park City, you could say that Bout Time Pub & Grub is Utah’s staple sports bar. Its MVP loyalty rewards program has created a Utah sports community that is hard to find anywhere else in the state. The Break is less of a widespread Utah community than a neighborhood hot spot. With live music, karaoke, poker nights, and a patio to enjoy during the summer months, the sports bar is an exciting place to enjoy a high-pressure game. Squeezed next to a bowling alley, a gym, and a theater, Leatherheads Sports Bar & Grill can be easy to miss. But don’t make that mistake: the joint has an inviting laid-back atmosphere that for some, is more appealing than crowded sports bars. If you’re a University of Utah fan, or are interested in getting in on the Utah college sports scene, the Point After Sports Bar & Grill is for you. This is where Utes congregate to cheer on their state university. With 38 flat screen televisions, great bar food, plenty of contests and giveaways, and even a selection of cigars for sale, this bar is always a party. Legends Sports Pub is best known for the size of its bar. With over 20 beers on tap in addition to more than 30 craft and local beers, Legends Sports Club also delivers with its poutine: a traditionally French-Canadian dish consisting of beer-battered fries covered in melted cheese and gravy. Poplar Street Pub likes to avoid the label of “bar food.” Located in downtown Salt Lake City, the pub focuses on fresh, hand-made ingredients and fostering a sense of neighborhood community. Founded in 1996, Fiddler’s Elbow is a nice accompaniment to Utah’s natural beauty. In fact, at Fiddler’s, you’ll feel like you’re in a cozy cabin or mountain lodge. Offering a mix of both heavy and light entrées, Fiddler’s is a great bar if you have a diverse party of eaters. Odds are, you won’t feel uncomfortable at the Huddle Sports Bar & Grill. The bar’s main aim is to make all customers feel at home, whether they are regulars or not. The Huddle serves up classic American bar food, including sandwiches and burgers, but make sure not to neglect their salads and competitive alcohol selection. Steiny’s Family Sports Bar & Grill wants to make you feel like you’re actually in the stands of a football or baseball game, eating stadium dogs and chicken fingers. And as classic as those menu items are, it is also worth trying their toasted ravioli and deep fried green beans for an atypical sports bar experience. Located in Utah Valley, Scorez Sports Bar isn’t as busy as bars in the greater Salt Lake City area, but it’s a tucked-away hidden gem. It’s a definite hole-in-the-wall, but sometimes, that is just the kind of sports bar experience you need.